In a previous post on this topic, I said it is wiser to get the big picture when looking at events or potential happenings. Don’t focus on one side of an issue, good or bad. I also mentioned that out-of-control government spending needs to be reigned in and, if done wisely, the negative effects may be minimized. As a matter of fact, there are some positive things going on despite what the government is or is not doing. Some things go in cycles and let’s take a look at the positive side of things. First, The Kiplinger Letter in a recent article stated that manufacturing this year and next will continue to drive the economy. It is one of the strongest drivers. Auto parts are still going strong despite a banner year in 2012. The housing market is pushing demand for wood products like kitchen cabinets, lumber, flooring and other related items. We can expect a 10% growth this year and 18% next year. This is awesome. I personally purchased stock in Home Depot several years ago and since then the stock price had increased nearly 30%. (I sold it for a nice gain). Looking at high tech manufacturing, we see strong demand for medical devices, wind power equipment, 3-D printers, robotics, computers, electronics, etc. Some U.S. manufacturers are bringing back production to our shores – it’s called “reshoring” and is a partial result of companies continuously seeking lower costs. Oil production is booming mostly in North Dakota, Texas, Kansas and Colorado. Oklahoma, New Mexico and Utah are in play as well. I have visited relatives in Hobbs, New Mexico recently and you can see oil pumps for miles, especially around Artesia. Hotels and restaurants are begging for help in Hobbs and other boom areas because most people are working in the oil fields or related services. The way retailers are adopting mobile devices for consumers has got to result in lower costs for these retailers. It will be interesting to know if and how the large retailers like JC Penny and Sears will fare when all is said and done (seldom is anything said and done, but you know what I mean). Both companies have had their problems, to say the least. The Bureau of Transportation Statistics reported that freight shipments rose 1.2% in February from January (2013). That’s an annualized rate of over 14%. Not too shabby. 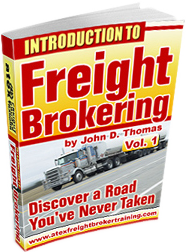 I have more and more clients asking me about starting a trucking operation in conjunction with freight brokering. This is ideal but only if you understand that trucking and brokering are very different and trucking requires sufficient capital to start and to maintain. I have never been in trucking but I do provide some financial information for some clients interested in trucking to give them an accountant’s perspective. So, there are many ways to get involved in these gigantic industries of trucking, logistics, freight, supply chain and freight brokering. But, caution: there may be obstacles ahead. The Kiplinger Letter goes on to state that some areas of the economy with a bright future may be found lacking any growth due to government regulation. The biggest threat to continued growth will come from state and federal rules, regulations and limits. I’m not talking about ordinary and necessary regulation; I’m talking about OVER regulation which seems to easily emanate from the norm. It’s no secret that jobs growth is lagging despite current and future growth in the various areas mentioned above. If you are an oil and gas engineer, no problem. You can expect to knock down about $95,000 starting out. But if you are in liberal arts, expect to do some serious personal or family financial planning just to keep afloat. And, the last area that concerns me are the “earmarks” that will grow in favor again after being somewhat curtailed in recent years. Earmarks, although not a large percentage of government spending, are symbolic of out-of-control government spending. These are usually politically motivated with little or no economic value. Don’t get me started here. So, what do you make of all this? Do you see opportunity? Or would you rather sit back and let others take the stage as they make their future? Small business is my passion and anything I can do to help makes my day. 1. The training and materials are detailed and comprehensive and are delivered to you from someone who has “been there, done that”. 3. No other trainer will get involved with your life like I do. After you have scoured the website and materials, let me know if you are ready to get started. Call me at 888-526-ATEX (2839).